Blogging has connected me to so many wonderful women, and one friend in particular -- Justine from Full Hands Full Heart -- has been such a wealth of helpful advice to me. She is a mom to four with their fifth baby on the way in just a few short weeks! 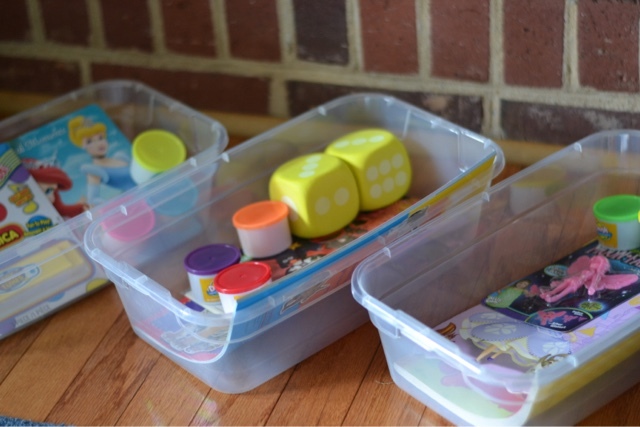 She recommended to me the idea of the "busy box" for toddlers, giving mama just a little more time to tend to the newborn when needed. A few days ago during naptime, I put together three boxes for Camille and thought I'd share them here. I decided to keep these simple and inexpensive ... all materials came from one store (Dollar Tree) and cost just $13. I put them together over one 1-hr nap of Camille's, so it was not a labor-intensive project. 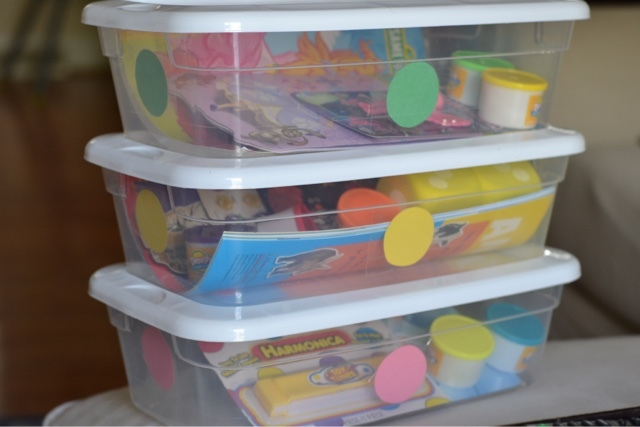 Each box has a few different elements to it, and Camille can select a box and then pick out an activity or two from that day's special box. 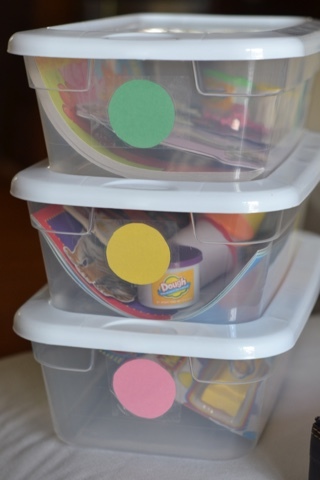 Now, to help Camille select a box, I decided to go with a simple color scheme to label them. She's gotten pretty good at colors, so I borrowed some of her construction paper and traced two circles from three different colors (using a plastic Easter egg as the circle template!) and then taped the circles to the interior of the box using clear packing tape. Camille will now be able to choose the green, yellow, or pink box (and man oh man, she loves a CHOICE these days and gets so much joy out of choosing her snack, her pajamas, her shoes, et cetera!) and then she can select an activity. 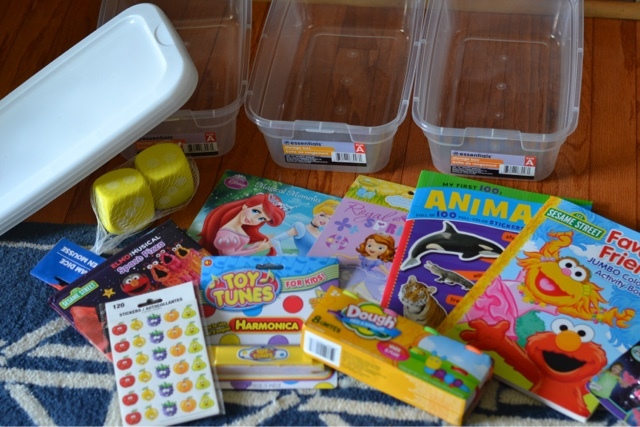 So, you can get as elaborate or as simple as you'd like with these boxes, and don't forget to rotate out the toys and activities from time to time to keep the boxes fresh! I'm excited to see these in action and hope that they help her stay excited during times that I will need to be devoting a little more attention to the new baby. 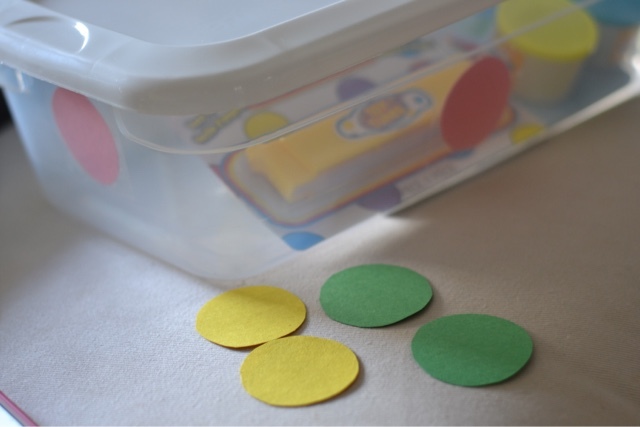 Have you tried an activity like this for your toddler? I'd love to hear what you filled your boxes with! We embarked on the joy of playdoh this weekend and used old fashioned cookie cutters and played on a very large (Lilly Pulitzer) tray with pretty tall sides, which contained the playdoh quite well, even on our carpeted family room! Just a tip from one Mama to another ;) Congrats!!! I did this with my son as well! He loved them (and still does at almost 4). I separated a lot of the smaller toys we have by theme. For example, I had all vehicles in one, magnets in another (and a cookie sheet is a quick and easy magnet board), small puzzles in another. I also did felt shapes and a little felt board for him to make faces or other things. There are so many great ideas on pinterest! Love this concept!! Bookmarking for next year! This is such a great idea! Thanks so much for sharing, and I will definitely be keeping this in mind! Love this idea! Seems super easy and affordable! Random question for you - I'm curious what you bought 2 of / what you plan to share between Camille and Baby 2? You are such a great mom! Love this idea! This is such a great idea! Wish I had thought of it many years ago when I had 2 under 2! Have a great week! These are awesome! You'll be so glad you have these when you're nursing baby 2 and C is looking for something to do!! These are so cute, I love the color-coding. So simple but so cute and guaranteed to make Camille feel a little special when she gets to choose something for herself! These are great! I'm going to need to make some for my 12 month old who is always a very busy bee.